Chesapeake at Easton Club East is a comfortably sized Del Webb community, which includes 452 single-family homes. Though the first section of the community was once open to all ages, the majority of the community is now age-restricted to those aged 55 and better. Chesapeake's spacious clubhouse includes the amenities that appeal to active adults, including a junior-Olympic sized outdoor pool, tennis courts, and a putting green. Though this lovely community is situated in a small town on the Eastern Shore, it is not far from major urban centers, including Annapolis, Baltimore and Washington D.C. This makes the picturesque town of Easton even more appealing to many potential homeowners. As with any Del Webb community, residents of Chesapeake at Easton Club East can enjoy a variety of features that support active adult living. The 11,000 square-foot clubhouse includes fitness facilities complete with cardiovascular and strength-training equipment, as well as a separate aerobics room. Those who prefer to swim can stay fit in the outdoor junior-Olympic sized pool with lap lanes. There are also two tennis courts, a putting green, a gazebo sitting area, scenic ponds and walking trails. The spacious clubhouse also contains rooms for impromptu get-togethers or social club meetings. Residents can enjoy a game in the card and game room or have fun in the billiards and dart room. They can cozy up with a book in the library or express their creativity in the arts and crafts studio; while the grand room is a multi-purpose ballroom that is the ideal location for community events, parties, and other activities that can hold up to 200 people. The single-family homes at Chesapeake at Easton Club East by Del Webb are available in many different floor plans and range in size from 1,600 to 2,900 square feet. Available on a resale-only basis, these beautiful two and three-bedroom homes include two to three bathrooms and attached two-car garages. While many homes are single-story, some of the larger floor plans have an optional second level. Two-story plans offer first floor master bedrooms with additional bedrooms upstairs. Residents of Del Webb's Chesapeake at Easton Club East enjoy a rich active adult lifestyle. The community's spacious clubhouse contains many amenities, as well as the perfect setting for a range of social clubs that meet on a regular basis. In addition to the formal social clubs, the community offers informal gatherings featuring games such as billiards, poker, bridge, canasta and more. Chesapeake by Del Webb's full-time activities director is also available to help residents find the clubs and activities that suit their interests. This comfortably sized community has many scheduled events and parties that give residents plenty of opportunities to get to know their neighbors. Chesapeake at Easton Club East is located near the Chesapeake Bay in the picturesque town of Easton, MD. This lovely small town, along with the neighboring communities of Oxford and St. Michaels, is a popular attraction along Maryland's Eastern Shore. The local activities include such popular events as the autumn Waterfowl Festival, the June Chamber Music Festival, and the First Friday Gallery Walks. Within 10 minutes of the community, residents will find shops and restaurants, golf courses, medical offices, fishing piers, bird sanctuaries, and much more. While there is plenty to do in Easton and all along the Eastern Shore, Chesapeake by Del Webb also enjoys close proximity to major urban centers. 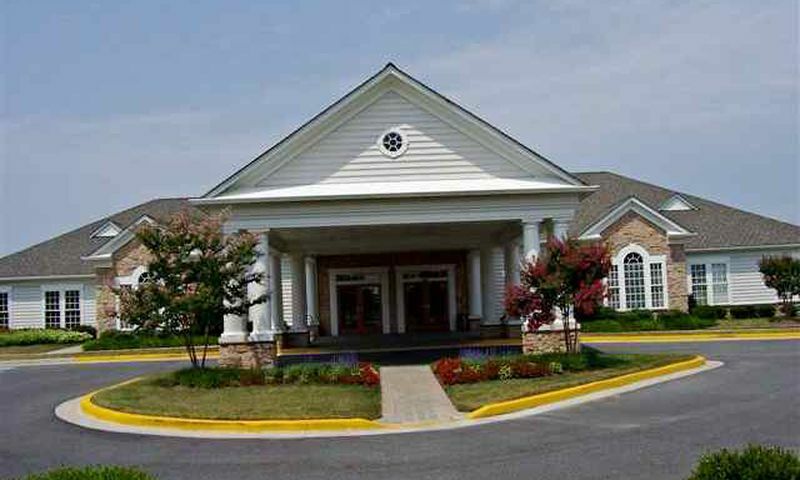 The community is only 45 minutes from Annapolis and an hour and a half from both Baltimore and Washington D.C. With easy access to attractions nearby and far, it's easy to see why Chesapeake at Easton Club East is a popular 55+ community in the Eastern Shore region. Easton Club East Clubhouse - 11,000 Sq. Ft. There are plenty of activities available in Chesapeake. Here is a sample of some of the clubs, activities and classes offered here. Del Webb's single-family homes were thoughtfully designed for active adult homebuyers. Built with low-maintenance exteriors and first-floor master suites, these homes offer between 1,600 and 2,900 square feet of living space. Available on a resale-only basis, these homes were built with two to three bedrooms, two to three bathrooms, and an attached two car-garage. Interior features include nine-foot ceilings on the first floor, a laundry room, gas heat and central air conditioning, and granite counter tops in the kitchen. Please Note: Floor plans are not available at this time. I'd give Chesapeake 4 stars. There are some things I think could have been done better, like the pool is too close the parking lot in my opinion and I wish it was gated. I do enjoy the walking paths and nice landscaping, the putting green is great (the guys are thrilled I'm getting better at putting), the fitness center has all the basics and the location is great. 55places.com is not affiliated with the developer(s) or homeowners association of Chesapeake. The information you submit is distributed to a 55places.com Partner Agent, who is a licensed real estate agent. The information regarding Chesapeake has not been verified or approved by the developer or homeowners association. Please verify all information prior to purchasing. 55places.com is not responsible for any errors regarding the information displayed on this website.